Patriot reveals the Supersonic Boost XT USB 3.0 drive. It seems a budget model though, it's only available in 8/16/32GB capacities and the max performance is just 90MB/s. Gain the performance advantage with the Supersonic Boost XT. 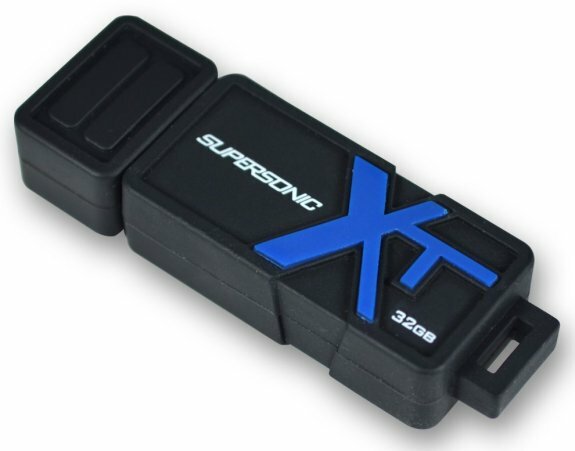 Supporting USB 3.0, the new standard in USB flash storage; the Supersonic Boost XT provides superior transfer speeds over USB 2.0 with performance of up to 90 MB/s. This extra performance makes the Supersonic Boost XT the perfect choice for large file transfers so you can always have your data in a fast paced, demanding lifestyle. Never be afraid to take your data anywhere. Designed with an ultra-durable rubberized water resistant housing, the Patriot Memory Supersonic Boost XT will not only provide the increased speeds of USB 3.0 but also provide the best protection from harsh elements and the wear and tear of heavy everyday use. Offering superior compatibility with easy plug and play functionality, the Supersonic Boost XT delivers seamless compatibility with Windows® 7, Windows Vista®, Windows XP®, Windows 2000®, Windows® ME, Linux 2.4 and later, Mac® OS9, X and later. * Advertised capacity is unformatted.